A Chinese NGO which has become famous for its disaster relief work has started to move into the world of wildlife conservation. 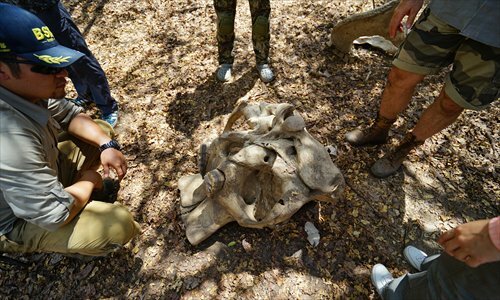 In an effort to raise Chinese domestic awareness and improve the country's image abroad, they have started an anti-poaching project in Zimbabwe. Despite resistance from local NGOs, they have pledged to carry on and find new ways for Chinese NGOs to go global. Blue Sky Rescue (BSR), an NGO, has helped save people after natural disasters in China, Myanmar and Nepal. But their latest effort involves saving the natural environment from people, when they sent a team to Zimbabwe to contribute to anti-poaching work in the southern African country. In May, their first batch of five volunteers, including three retired special forces soldiers, arrived in Zimbabwe, along with equipment such as boats, vehicles, firearms, medicines and a drone. "The motivation for us to launch the project first came from our regret about how small the Chinese presence was in these efforts and our bad reputation for wildlife conservation abroad," Wang Yingjie, one of the people behind the project and BSR's public relations director, told the Global Times in a recent interview in Beijing. China is a major market for the products of wildlife poaching and trafficking in Africa, due to demand for ornamental ivory, delicacies, items that are seen as medicinal, and live animals for zoos. In October, a Chinese businesswoman, dubbed the "Ivory Queen," was charged with smuggling nearly 1.9 tons of ivory worth millions of dollars from Tanzania to China between 2000 and 2014. "We want to get involved in conservation so as to help raise people's awareness of wildlife protection back in China. What's more, we want to make an effort to share the responsibility and improve China's image," noted Wang, who spent 20 days in Zimbabwe in November. "Non-governmental charity work is an effective way to enhance national feelings and mend relations," he added. But their mission was met with mistrust and even resistance. Some locals saw their weapons and assumed that they were using anti-poaching patrols as a cover for poaching, and some NGOs worried that their funding might be affected, he explained. There are a lot of NGOs engaging in wildlife conservation and anti-poaching activities in Africa and many of them are backed by Western charities. Each year, millions of dollars go to that sector. "Some people are not happy to see the Chinese becoming conservationists, as they worry that Chinese involvement might threaten their chance to gain attention and charity funds," Wang noted. With the help of the Chinese Foreign Ministry, BSR reached an agreement in February with Zimbabwe's Ministry of Environment, Water and Climate to conduct their anti-poaching program. Wang Yingjie gave three reasons why they chose to cooperate with Zimbabwe first: the Zimbabweans are "mild," the country has a good relationship with China, it is politically "stable" and its abundant intangible cultural and natural heritage is in critical need of conservation. Li Chun, 28, a registered member of BSR with a first aid certificate and experience of drone flying, was among the first batch of volunteers that set out for Zimbabwe on May 22. "When I heard the call, I immediately applied to go," Li, a resident of Suzhou, East China's Jiangsu Province, told the Global Times. BSR, established in 2007, has more than 30,000 registered members across China, including 1,000 who have obtained special rescue or first aid certificates. The areas of Zimbabwe in which BSR mainly operate were Hwange, Matusadona, and Mana Pools national parks. By working with park authority officers, they patrolled the parks nearly every day, armed with shotguns. Their opponents were experienced poachers equipped with advanced equipment. An unnamed worker from the Wildlife Conservation Society told ifeng.com in a recent report that some poachers use machine guns, night-vision goggles, rocket launchers and even helicopters. Some Islamist terrorist groups have even become involved in the trade due to the profits up for grabs. They make use of well-armed rebels or even force local residents to poach, said the report. BSR member nicknamed Dengsheng (lamp cord) who is now assisting the park rangers in Mana Pool park told the Global Times that several illegal hunts have been discovered in the park in the past two weeks. In one, nine wild dogs were poisoned with cyanide. In another incident four elephants were found dead when a poacher was discovered in the act and fled. "We feel very anxious. Such cases happen nearly every week. The effect of the ground patrols is too limited. Air patrols are essential," said Dengsheng, 36, a PR manager of a bond club in Beijing. Li said their trip was the first time she was so close to wild animals, and that baboons and elephants frequently visited their camps. "Another thing that made an impression on me was the high cost of medical treatment and daily necessities, such as rice and water," she said. According to Wang, the six-month-long anti-poaching project cost as much as 1.9 million yuan ($293,400). Apart from 380,000 yuan obtained through online public donations, they collected the rest from their own pockets and their friends. BSR has decided to build a permanent camp in Zimbabwe, offering technological help and facilities for volunteers to conduct sustained anti-poaching activities. The camp, located at the Mana Pools National Park, is under construction, Wang said. "I'm not worried about funding its maintenance. I'm confident in Chinese philanthropy power," Wang said. What does worry them is the resistance they faced from some local NGOs, he said. At the beginning, their applications to go into the parks were rejected by environmental departments who later revealed that they received complaints and protests from other wildlife conservation NGOs. On one hand it's understandable that some NGOs are cautious about Chinese involvement in wildlife conversation due to regular reports of Chinese involvement in the illegal wildlife trade. But on the other hand, some NGOs may have been motivated by fear that their dominant status in the area may be challenged by Chinese newcomers. 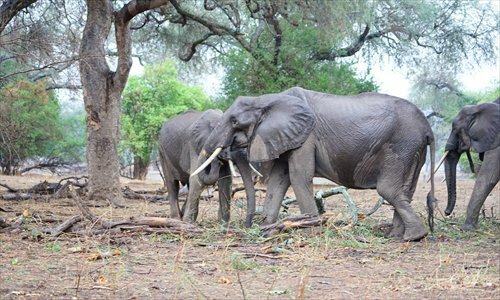 "Some carry political bias and they got used to Chinese playing the role of poacher and trafficker," Wang said, adding that in Hwange park, the largest park in Zimbabwe, there are more than 100 NGOs and they compete for resources. Due to corruption or poor management, usually less than 10 percent of charity funds truly go to the cause, said a Chinese observer who has lived in Zimbabwe for more than 20 years. "By exaggerating the situation of poaching, the more attention and funds they [NGOs] will receive," Wang added. Some NGOs welcome Chinese involvement. "We would support all well directed anti-poaching support from China and would encourage joint ventures with reputable local organizations," Richard Maasdorp, strategic director of the Zambezi Society, told the Global Times in an e-mail. "Chinese involvement can be highly significant and positive, if partnerships are formed," said Maasdorp. The Zambezi Society, a non-profit organization founded in 1982, mainly conserves the wildlife and wilderness resources around the Zambezi River and its catchment area, including Mana Pools National Park. He said they hadn't been informed about BSR's arrival, suggesting that Chinese volunteers meet with reputable local people and organizations so as to develop harmonized strategies, tactics and deployment of resources. Otherwise, it's easy to make mistakes, he said. "One of the mistakes made by Chinese involvement in business has been to bring in skills that already exist in the country. That has led to resentment rather than working together," he said. He added that the key obstacles facing anti-poaching work in Zimbabwe are a lack of resources, the absence of modern management practices, little systematic research and monitoring, corruption and donor support that has no relation to the needs on the ground. To facilitate their work there, Song Li, deputy president of the Chinese Federation of Zimbabwe, founded the Sino-Zim Wildlife Foundation on September 1. Song, the chairlady of the foundation who has lived in Zimbabwe for more than 20 years, spends most of her spare time on anti-poaching activities. "All of the board members are unpaid volunteers, which is a different from many other European counterparts," Song told the Global Times. However, in a report posted on the website of the Conservation Action Trust in May, Song was named by anonymous sources as a key player in the controversial export of elephants to China. Song admitted she assisted a safari park in China acquire 24 elephants from Zimbabwe in 2014, but insisted all the procedures were legal and she didn't make any money. "The number of elephants in Hwange national park reached 55,000 but its capacity is only 19,000. Live trade is also a way of protection," she noted. Wang said BSR is trying to pioneer 'walking out' for Chinese NGOs. "China has received assistance from foreign NGOs, and it's time for us to go out and share our own skills and experience," Wang said, noting that civilian charity efforts will improve international feelings. When the Wenchuan earthquake happened in 2008, Japan immediately sent a search and rescue team to disaster-hit areas of Sichuan, which moved many Chinese who had been previously hostile to the Japanese. BSR's rescue efforts in earthquake-stricken Nepal and aid to Myanmese refugees have also been well received among locals. In recent years, China has cracked down on illegal wildlife trafficking. In October, Chinese authorities announced a one-year ban on imports of African ivory. On a three-day visit to Kenya in May last year, Chinese Premier Li Keqiang announced that China would provide $10 million to support wildlife conservation in Africa. On a visit to Zimbabwe in early December, Chinese President Xi Jinping reiterated Chinese commitment to wildlife conservation. In the middle of December, China donated equipment worth $2.3 million to Zimbabwe to curb poaching. But government-led efforts are always viewed with suspicion or seen as mere PR efforts. Civil exchanges and charity work without any political bias have advantages, Wang noted. The BSR anti-poaching program currently focuses on training park rangers to use and maintain the donated new equipment. "Now it only takes a week for the rangers patrol the whole park, much shorter than the two months it used to take," Wang said. Next, they will bring Chinese wildlife, agriculture and tourism specialists to Zimbabwe and explore ways to help local residents escape poverty by growing money-making crops and attracting tourists from China, Wang said. Meanwhile, Wang said BSR has started to look into other humanitarian projects like providing education and medication to other countries. In northern Myanmar, they have started an education program. In South Sudan, they have dispatched specialists to do pre-project studies in regards to a planned vaccination program for newborns. By going to the grass-roots level, NGOs know the needs of a country and can offer guidance for the government's foreign aid efforts. In the long run, Wang wished that the Chinese government can follow practice of Western countries, to purchase NGOs' services instead of directly granting them funds.